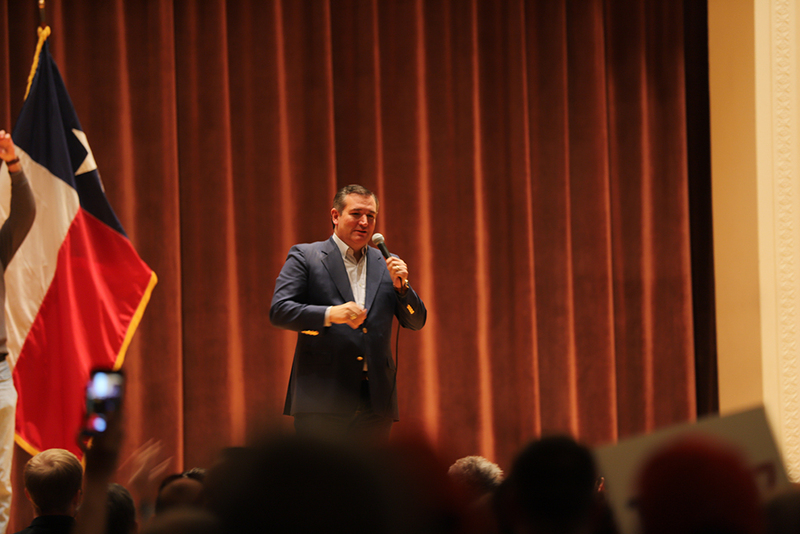 About 600 people, including 100 students, attended a rally at Akin Auditorium in Wichita Falls Nov. 1 for Ted Cruz, U.S. senator of Texas and Republican candidate for the U.S. senate election. Cruz came to Wichita Falls as part of his #CruzToVictory tour across the state. “We are barnstorming the entire state of Texas. We’ve got a big bus, we’ve been everywhere. We’ve been in east Texas, west Texas. We’ve been in the panhandle, the valley, everywhere in between. This election is about turnout, we are encouraging every Texan to turn out and vote. If you want to keep this economic boom going, if you want to keep low taxes, low regulations so that small businesses can expand and young people can come out of school and get a job, then vote to protect that. If you want to protect our constitutional rights and the Bill of Rights, vote to protect that by voting for us. 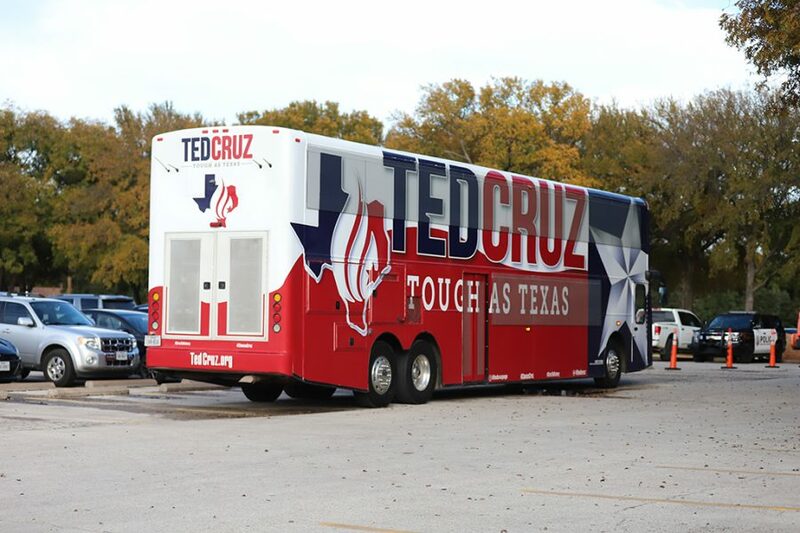 We’re traveling around the state, encouraging everyone to come out and vote,” Cruz said. Cruz said a solution to get out of student debt is to have an economy that provides jobs. Cruz believes in two principles that guide his beliefs towards educational issues. “When it comes to education, there are two principles that I believed are the most important. Number one is local control. I think there should be as little interference from the federal involvement as possible. I think education decisions should be made at the state level and even better at the local level. Because the needs in Wichita Falls are different than the needs than the ones in Houston and both [Wichita Falls and Houston] of them are different than the needs of New York City. We don’t need one solution from Washington dictated for everyone, rather the solution should meet the needs of each communities. Secondly, I believed we should do everything possible to expand choices, and expand competition. The best way to improve that quality to give students better options is to have a multitude of choices available. I have for decades been a leading proponent of school choice. I think school choice is the civil rights issues of the 21st century in that, every child in Texas and every child in America deserves access to an excellent education regardless of your race, ethnicity, your wealth, your zip code.” Cruz said. Cruz said getting a good education opens the door to the American dream. “Just like it did for my dad in 1957 when he fled Cuba and came to the United States [at] 18 years old, not speaking English, washing dishes and making 50 cents an hour, but he was able to go to the University of Texas, and get a degree, start a business while building a career. The more educational choice, the better,” Cruz said. Cruz said as part of his beliefs of school choice he helped pass the 529 savings plans by voting in favor of the proposed legislation that was introduced by himself. “Last year, I introduced and passed the most significant federal school choice legislation that has ever passed. The 529 savings plan, which allowed parents and grandparents to save a tax-advantaged way for college expenses, expanded it, so now you can save through K-12 education. You can save and spend up to $10,000 per child, per year, public school, private school, religious school, parochial school, your choice. It [the 529 plan] was a 50-50 vote in the Senate floor with the vice president [Mike Pence] casting the tie-breaking vote at 1 a.m.,” Cruz said. Stephen Santellana, mayor of Wichita Falls, said he does not have a political affiliation when hosting O’Rourke or Cruz this week. “Being a non-partisan position as a mayor, we don’t declare as Democrat or as a Republican. I am going to work with whoever is going to get elected. We have a lot of federal grants and federal money, and things that passed from the federal government to state government to municipalities. I don’t get to pick and choose. I need to work with the 105,000 citizens that I represent,” Santellana said. Santellana said that Wichita Falls is a significant point of interest for O’Rourke and Cruz. “They’re [O’Rourke and Cruz] coming here for a reason. They feel that Wichita Falls is an important stop. That makes me proud in that, we’re not insignificant in the eyes of our current senator and maybe a future senator. We want to stay current, work hard at staying current and staying visible in the eyes of our higher-elected officials. As many times as they have stopped here, they find us significant and that really makes me happy,” Santellana said. Santellana said he is happy to see the early voting turnout of both Texas and Wichita County. “We’re setting records right now across the state. You can’t beat that. I have been trying to get people to go out and vote. Running for mayor, you only had probably a tenth of a population to go out and vote and I am here representing the 100 percent of the population. It is nice for me to see that through early voting, we’re already at 22,000 people. We really have a good representation out there and seeing people show interest,” Santellana said. Santellana said there are two reasons as to why your vote matters, but to participate in all elections including local elections. “One, you want to be stand up for your party. Two, you want to be stand up to your candidate. You want to vote all the way down to the local level. A lot of people see that presidential race as important, but your local issues are the tangible issues that surround you every single day. Federal issues might not, but locally, every decision we have is a decision for 105,000 citizens,” Santellana said. RJ Sayler, accounting junior, said he attended the event in order to see Cruz’s skills as an orator. “I wanted to see what is like to see a Havard debate champion in person,” Sayler said. Sayler said he has yet to decide as to who he is voting for due to the issue of researching more on the candidates. “I don’t want to blindly vote for a candidate. I want to spend some time and do some research as to who is running and what their platforms are,” Sayler said. Sayler said that he will likely make a last-minute decision during election day.